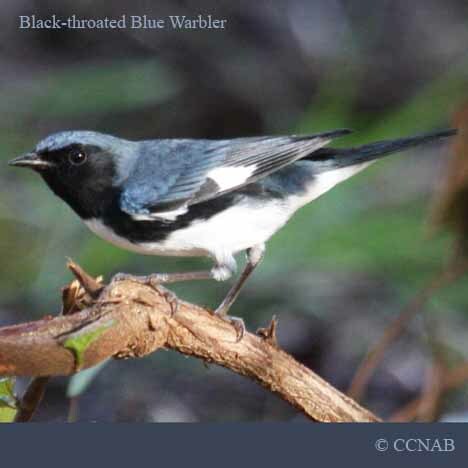 Species: The Black-throated Blue Warbler (Dendroica castanea) is seen in eastern North American. 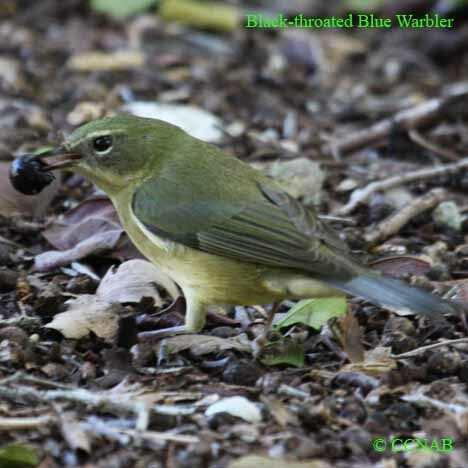 This warbler prefers feeding close to and on the forest floors. Where it can be easily observed, as it hops and flies from one shrub to another, or actually feeding on the forest floor. It can be seen in coniferous or coniferous/deciduous environments. The female is less conspicuous than the male, and may be harder to seek out. 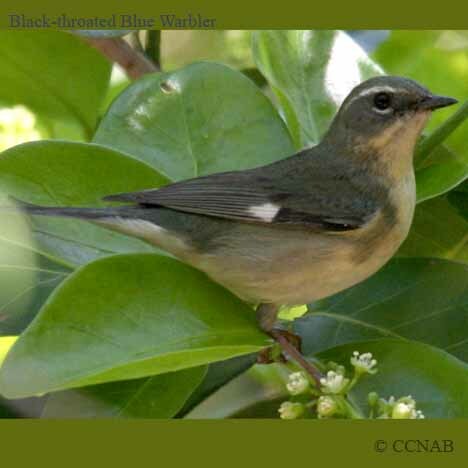 It migrates to the Caribbean Islands, Central and South America during the winter months. Distinctions: The male is distinguished from the female. It has a dark blue crown, back, wings and tail. The face and throat, is black, including its flanks. 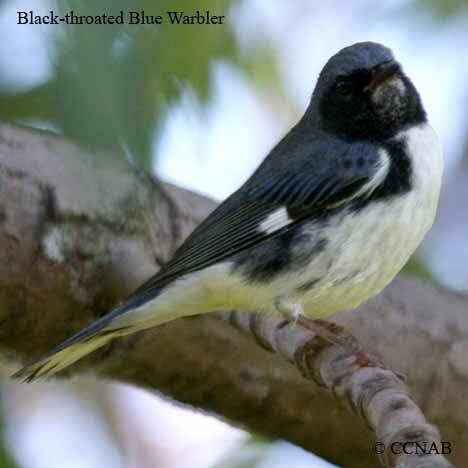 A noted white patch on the primaries is seen on both sexes, more obvious on the male. The female has the most difference appearance between the male and female of all warblers. 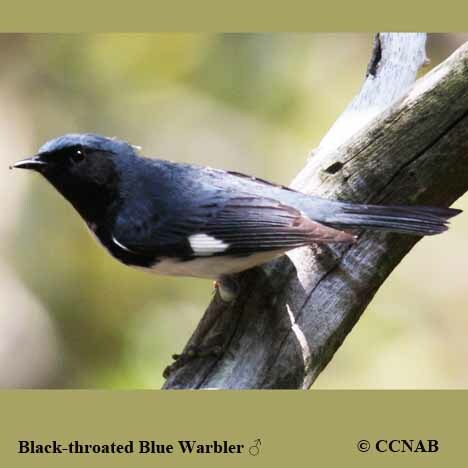 It has a brownish-green body, including the head, neck, back, wings and tail, all with no signs on streaking, dark cheek patch, tan coloured flanks, and a soft whitish-brown breast. An important field mark seen to point out, is a half white cresent seen below the eyes. Voice: Chipping call, slow and heavy notes, sound like zur, zur,zree, continuous calling. Nesting: Three to five white to creamy coloured eggs, with brown markings. It nests might be found in a small deciduous for coniferous trees. The nest is composed of finer bark stripes, leaves, twigs, pine needles, mosses, and lines with fine grasses and hair. Distribution: Found from Newfoundland through southern Quebec, around the Great Lakes, reaching as far as Manitoba, and some of the US states. Reaching south to the top of Georgia, north into New Jersey. Through the north-eastern states, and the provinces of New Brunswick and Nova Scotia. Some may spend their winter months in southern Florida.